One Search is one of the research functions available to you through our library catalog. It is a direct connection to the research databases to which Lakeview Academy subscribes. 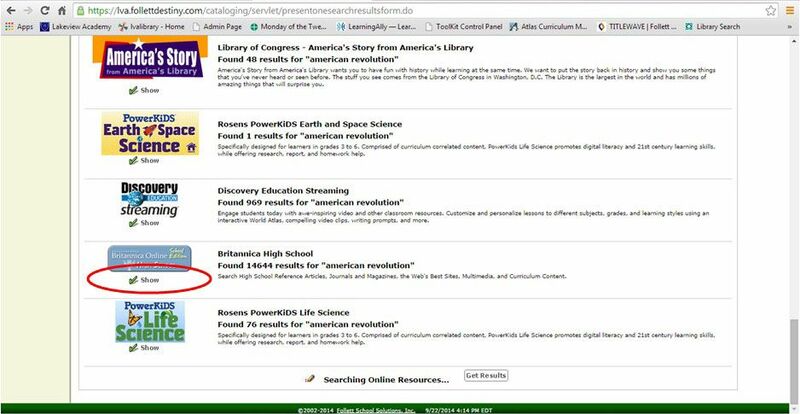 To get to the One Search function, first go to the library catalog: https://www.lva.follettdestiny.com. A direct link to the catalog can be found in It’s Learning or through the library wiki (www.lvalibrary.wikispaces.com). If the screen looks like the one below, click on Lakeview Academy. From here, you can log in (as circled in red) to save your search. Your log in is your first name. last name. Password is the same as your lakeview email. Notice the “One Search” button in the upper right-hand corner (as circled in red.) Click here to get results for your topic from our online resources, including Encyclopedia Britannica and EBSCO. Please note, that you will have to click the “Get Results” button at the bottom of the page to get all of the results from your search. When you see your search results, select which resource you would like to explore and then click the “show” button to see what articles, videos or images are included in your selection. Click on any article in blue print to go directly to that item in the database. Notice that you can also add any of these articles to your list. THIS IS WHY IT IS IMPORTANT TO LOG IN when doing a search. Otherwise, your search will not be saved when you exit.